In my ongoing series about safer junctions I have covered Dutch junction design and how it differs from that of other countries. I then showed you that the Dutch have now discovered that urban roundabouts are safer than cross roads junctions when they are built to a specific design and give cyclists priority. As stated in that story the first modern roundabout with priority for cyclists was in Enschede and as it turns out Fietsberaad has a file with a lot of background information about this good practice example. So could it be any safer? Yes, multi level solutions are even better. 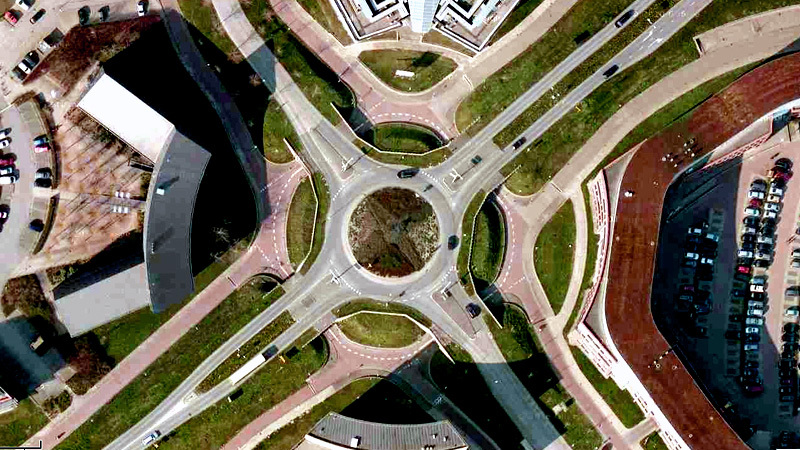 This roundabout in Houten has two levels of completely separate roundabouts. One for motorised traffic and one for cyclists. As you can see in the video there is no conflict at all anymore between these different modes. If you want a junction to be safe this is really state of the art design. It is not a spectacular video, but you loose the “excitement” on the streets when you eliminate all conflict. It does show how junctions can be made safe to use for all. This multi-level roundabout was part of the tour of the Australians when we showed them Houten last Saturday. It can be found in the former South part of the ring road of the first new Houten. When new Houten was expanded from the 1990s this road became the only shortcut for cars in the city. Original Houten in red. 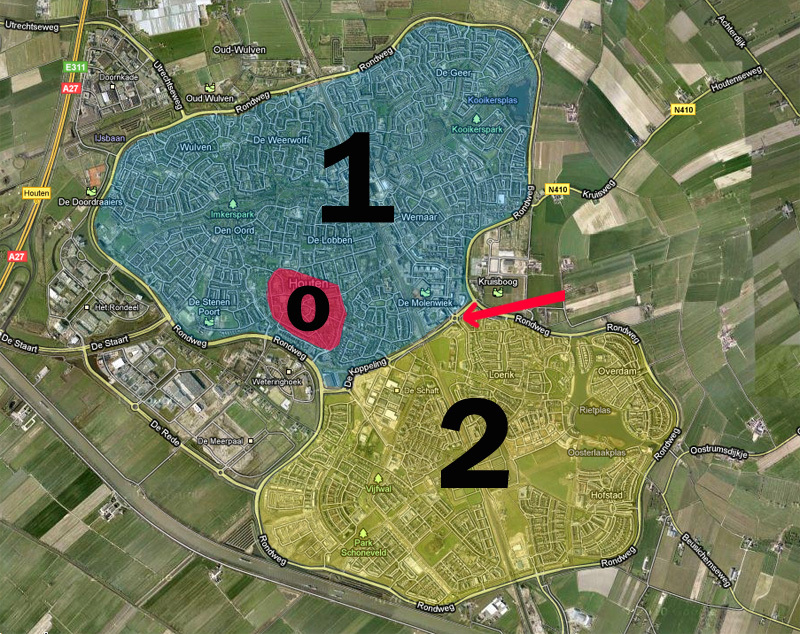 The first new Houten (1) and the second new Houten (2). The former South part of the first city ring road is now a short cut between part 1 and 2. The arrow points to the multi-level roundabout. Of course, not all junctions can or should be changed into a (multi-level) roundabout. But for some key junctions it can make the essential difference between a pleasant ride and a barrier that cannot be taken. There are some junctions like that in England. I believe there is one in rotherham, when I last used it the underpasses were sprawled with graffiti and covered in broken glass which seems to be common with underpasses in Britain meaning they are rarely built nowadays. A cycle underpass in my home town was filled in and replaced with a signalised crossing due to 'social' problems with it. There are a lot of these in Milton Keynes, often with a displaced arm design, the cycle and walk way being turned 45 degrees from the roads resulting in an inner cross roads for bikes. It is a good system although in the past it has been difficult to navigate these routes. Signage has been improved but it remains a very different view of the city. And not only are multi level solutions safer, they reduce delays for all road users, which is why interchanges are the preferred option on major dual carriageways and motorways. However, one should be mindful of the motivation behind both cycle and pedestrian underpasses - are they simply a way to get non motorised traffic out of the way, or do they form part of a genuinely useful network of cycle routes? In the UK, the former is the case, especially in situations where the road is over-engineered in terms of speed for its location. Guildford has a gyratory system, which as well as incorporating a pre existing street that forms a major pedestrian route and is also home to several bars and clubs, has another section with no at grade pedestrian access. Of course, pedestrians are not forbidden from this road. They are, however, corrrelled into underpasses and walkways; and therefore it should be noted that whilst multi level solutions may be good at major junctions, those "major junctions" shouldn't dominate town centres in the first place, and the multi level solution is probably better further out where traffic is faster and the safety benefits greater. @Christhebull; exactly right. This solution is only suitable for major junctions with a high volume of traffic and not in city centers. That is what I meant with my last sentence. Both the examples I show in the videos are in (former) circular roads. Social safety in tunnels is always very important. The Dutch also used to have narrow dark tunnels that were terrible, but once they were built wider and lighter they were a lot more inviting. But maintenance is very important! As it is with all (cycle) infrastructure. Looks great! They also seem to take lots of space, so proper planning right from the beginning is probably required. And look, Mark, you do have hills - coming from the underpass back to the street level. Mark, since you produce nice videos, it would be great to see one from a hilly portion of your country...if there is one ;-) If you decide to come to Canada, I can give you a free study tour of hills, and show you how to properly run away from a bear. Well, more seriously, there are beatiful country vistas to bike through here, so if you decide to visit, you can let me know. • Having a wide, gently sloping, open approach right until the point where it passes under the roadway for maximum visibility. • Sloping walls in the tunnel itself to provide the illusion of width and make it a less appealing place for ne'er-do-wells to hang out. • Graffiti-resistant tiles in bright colours, preferably largely white. • A gap between the carriageways to let in natural light. The tunnels in these two videos don't show any of these advances, as they've been built decades ago. @Anonymous; all the 'tricks' you mention are right and used. They can be seen in the second movie in the other tunnels and also in the 70yo tunnels you see the bright graffiti resistant tiles were added recently. I found an example of a well-designed underpass that follows all the current design recommendations in the Fietsberaad Flickr stream. There's various other modern designs in there as well.